Home - Saskatchewan Airshow 2019 - Prairie Skies Come Alive! Our performer lineup promises to deliver breathtaking, adrenaline filled flying displays, while our static display allows spectators to see a range of impressive aircraft up close. Be sure to check our performer page regularly for the latest performer announcements! There will be plenty to do for the whole family in between the awe-inspiring performances. 15 Wing Moose Jaw is the proud host of the Saskatchewan Airshow. Learn more about the rich history of this Canadian Forces Base. Make some memories. Be a part of one of Saskatchewan’s premier events. The sky is your stage. 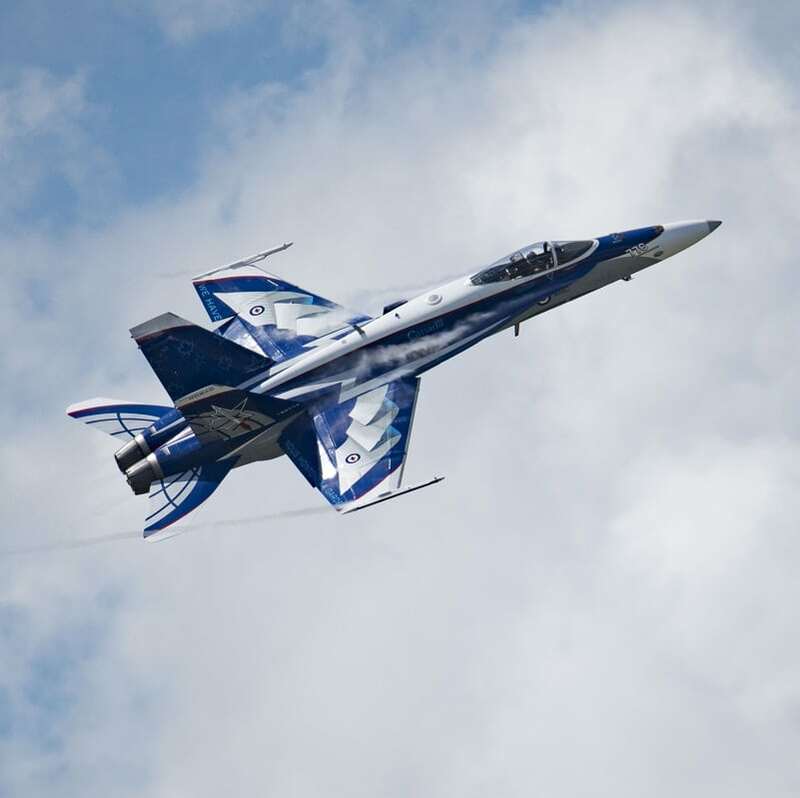 Take your brand to the skies at the Saskatchewan Airshow. Volunteers are vital. Support us in bringing an exceptional event back to our province. Showcasing Saskatchewan at its best. The Saskatchewan Airshow is proud to work with local vendors. Connect with the aviation legacy of Saskatchewan. Read the latest news, sign up to be an Airshow Insider for the latest announcements or follow us on Facebook and Instagram. Saskatchewan Airshow tickets now available for purchase! 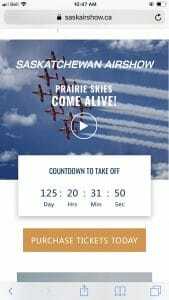 Tickets for the Saskatchewan Airshow, presented by CAE, are now available for purchase on the Saskatchewan airshow website. Early bird tickets will be on sale for 40% off of the regular price until April 1st. WANT TO BE AN AIRSHOW INSIDER? Stay up to date with everything, Saskatchewan Airshow related, as it happens. Get exclusive offers and access to performer, entertainment and vendor announcements, and much more! Thank you for joining our mail list. 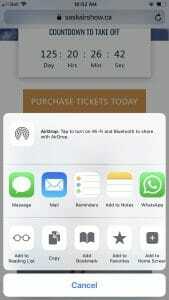 Check your email for exclusive offers, access to performer, entertainment and vendor announcements, and much more! © Copyright Saskatchewan Airshow 2019. All Rights Reserved. Developed by Wow Factor Media. Tickets will go on sale on National Aviation Day, Saturday, February 23, 2019. Be sure to check back then to purchase your ticket! The Saskatchewan Airshow team is dedicated to providing a top class and memorable experience for all of our visitors. Our aim is to work with as many Saskatchewan-based food vendors as possible to showcase the best our province has to offer. Our vendor application form is coming soon! Please check back for further details. Be at the centre of all the action! Volunteering at the Saskatchewan Airshow is a unique opportunity to be part of one of Saskatchewan’s premier events. There will be a number of volunteer roles that play an essential part in the success of the event. Our volunteer application form is coming soon! Please check back for further details about volunteer positions. The Canadian Forces (CF) Snowbirds, 431 Air Demonstration Squadron are a Canadian icon comprised of Canadian Armed Forces (CAF) members and National Defence Public Service employees. The CF Snowbirds proudly and eagerly uphold the legacy of military aviation excellence as Canada’s Air Demonstration Team. Serving as ambassadors of the CAF, the CF Snowbirds demonstrate the high level of skill, professionalism, teamwork, discipline and dedication inherent in the men and women of the CAF and they inspire the pursuit of excellence wherever they go in North America. 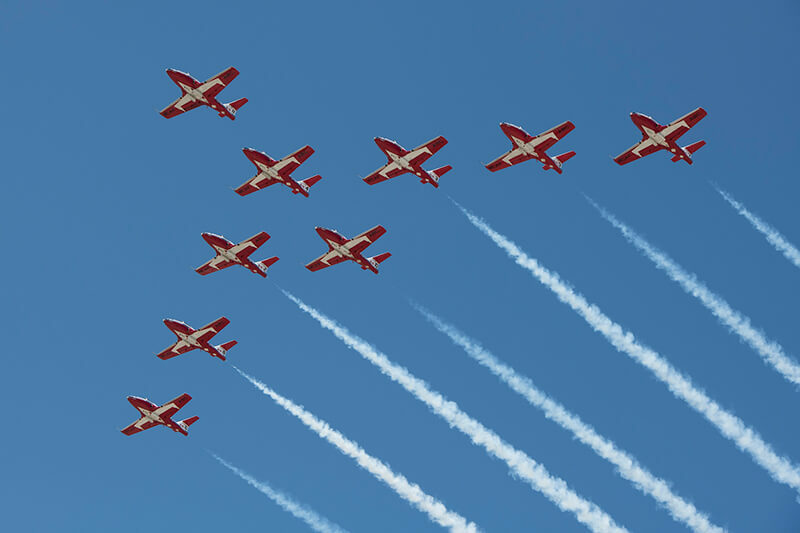 Your 2019 Canadian Forces Snowbirds reflect the diversity and opportunities available equally to men and women in the Canadian military. Each member of the Snowbirds’ team is a full-time serving member who demonstrates the skill, professionalism, and teamwork essential to achieving aviation excellence. 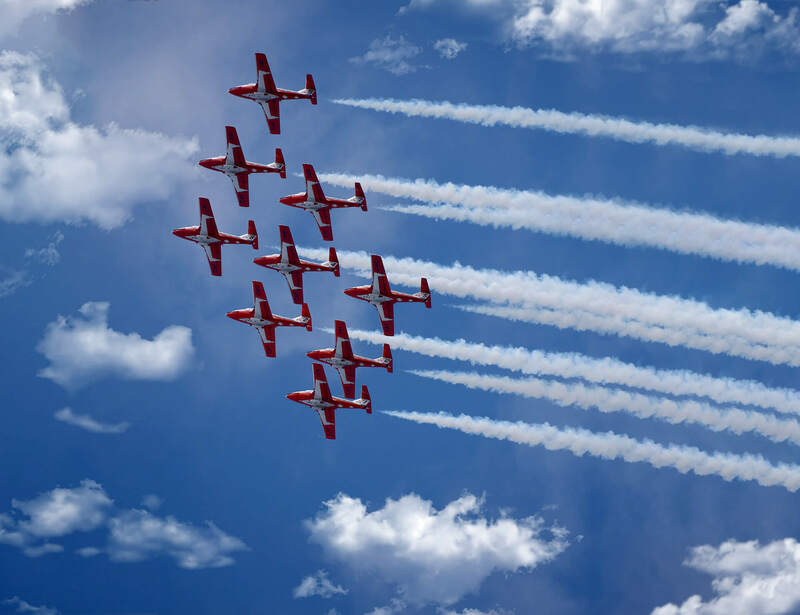 In their 49th season, the Snowbirds continue to inspire with thrilling aerobatic performances and breathtaking fly-bys over cities and towns across Canada and the United States. Brent Handy is an unrestricted, surface-rated aerobatic performer. Born in small town Wyevale, Ontario, Brent knew from a young age that he wanted to spend his time in the air. His air show journey began in 2012 when he flew in the opposing solo position for the Canadian Forces Snowbirds. Expect an adrenaline-filled, heart-pumping series of tumbles, torque rolls, and loops. 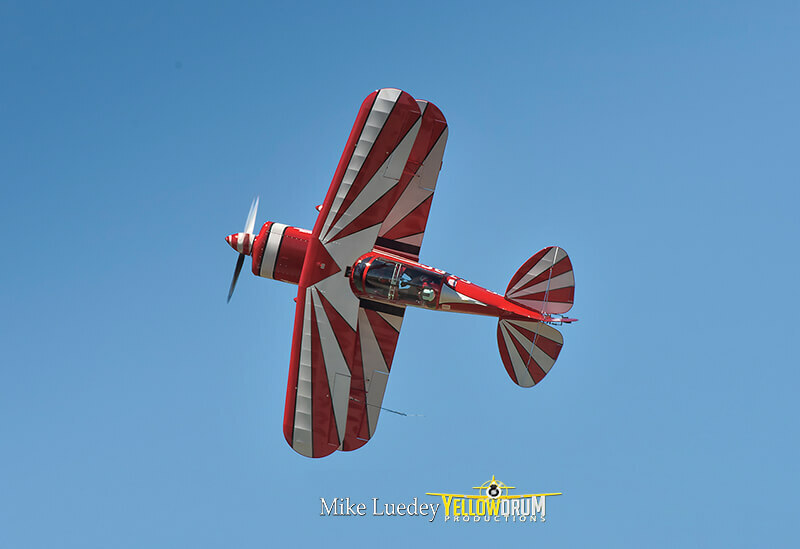 The Pitts Special is THE air show airplane to inspire young and old to pursue their passions! Brent’s early flight training was earned through the Air Cadet program. His first solo was in an Air Cadet glider, at age 16. Ten years later, Brent’s dream of becoming a CF-18 Hornet pilot was a reality. And through a fortunate series of events, he was selected to fly as a team pilot with the renowned Canadian Forces Snowbirds jet team in 2011. Every year, the Air Force selects a special group of people to make up the CF-18 Demonstration Team. The CF-18 Demonstration Team is a truly national team; all members come from Royal Canadian Air Force (RCAF) units across the country, and each one is selected for his or her superior performance, dedication to excellence, and the desire to represent Canada’s operational air force. Without the hard work of each and every team member, the CF-18 Demo Hornet would never get off the ground. The team is comprised of thirteen members including the Demo pilot, eight technicians, three safety pilots and a public affairs officer/narrator. Captain Brian Kilroy is the pilot for the 2019 CF-18 Demonstration Team. The supersonic CF-188 Hornet, popularly known as the CF-18, is a multipurpose, high performance twin-engine fighter. This impressive jet generates enough thrust to lift 24 full-sized pick-up trucks off the ground! 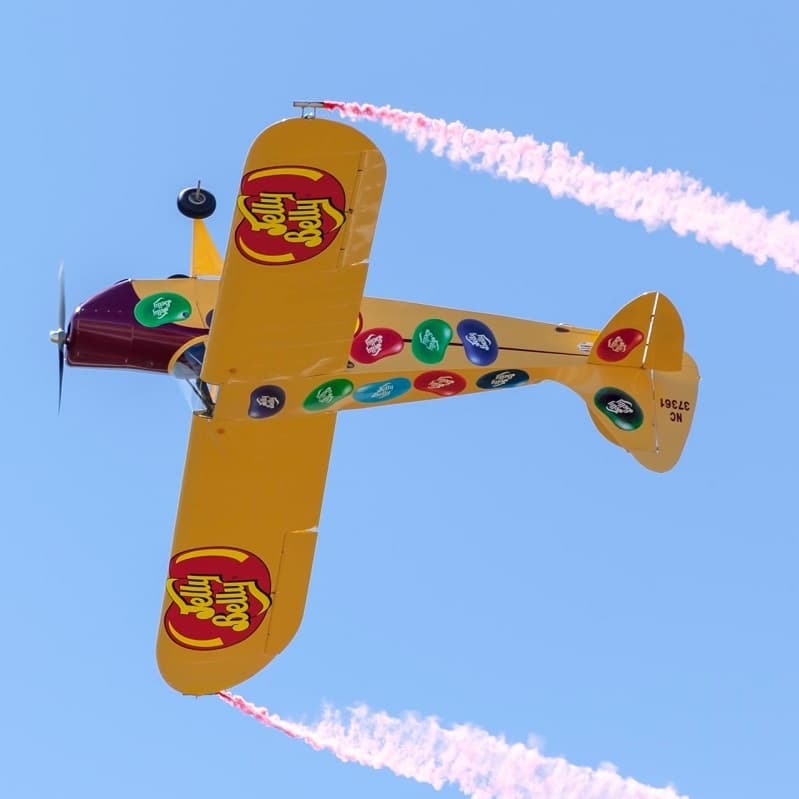 Airshow spectators around the world have been treated to the unique variety of acts performed by veteran pilot and consummate entertainer Kent Pietsch and his Jelly Belly airplanes. His shows, which include specialty acts designed to thrill audiences of all ages, showcase aerobatic stunts featuring airplanes that lose parts, engines that quit in mid-flight, and landings onto runways mounted on moving vehicles. Kent has enjoyed presenting the fun of flight to air show audiences for 40 years. Kent’s enthusiasm for flying started in 1967 when, at age 16, he completed his first solo flight. His passion turned into a full-time career just three years later when he began flying commercially. In 2007, Kent took early retirement from a major airline to pursue his real passion of performing in the air show circuit. As a premier air show performer Kent strives to show the freedom of flight. While his acts push the limits of what he and his airplane can do, Kent adheres to strict safety standards making him a true professional in the air show field. 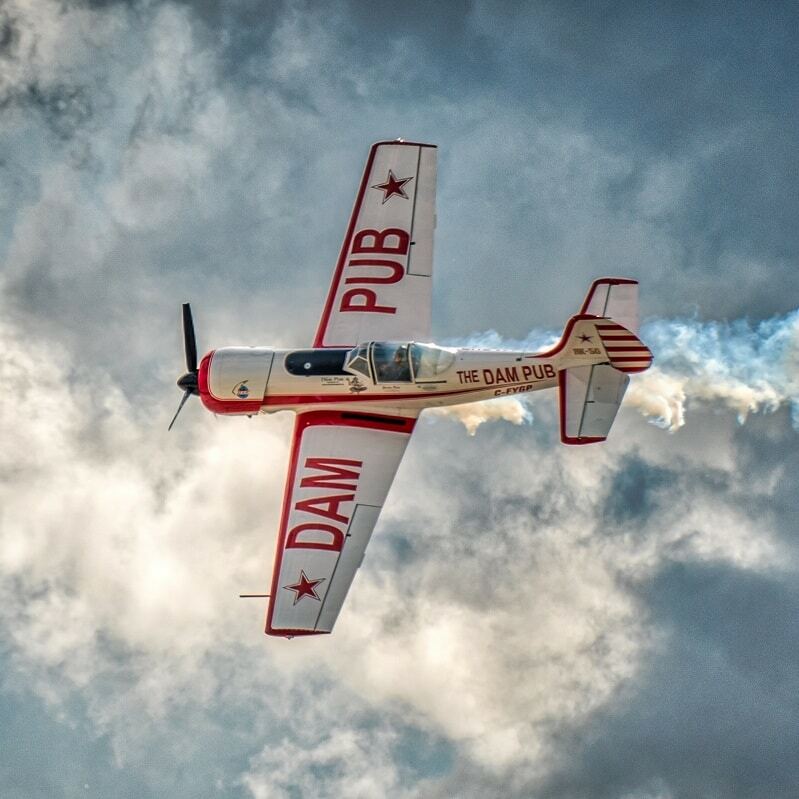 Gord Price sponsored by The Dam Pub has been performing airshows since 1976. He has been a RCAF fighter pilot, an airline captain and represented Canada at 3 FAI World Aerobatic Championships. Not only is Gord an incredibly experienced pilot, he also designed, built and flew the ‘Ultimate ‘series of biplanes. Today, Gord flies the prototype YAK 50 with a newly installed 435 hp engine. This is the only YAK 50 registered in Canada. 77 years old still pulling +7 G and pushing -5. Air Canada Captain for 36 years. Retired from Boeing 747-400 in 2001. Developed the ultimate wing and doubled the roll rate of the Pitts Special. Flew CNE in 1988, 2017, 2018, Oshkosh 4 times in 80s. Designed, built and flew the ‘Ultimate ‘series of biplanes. 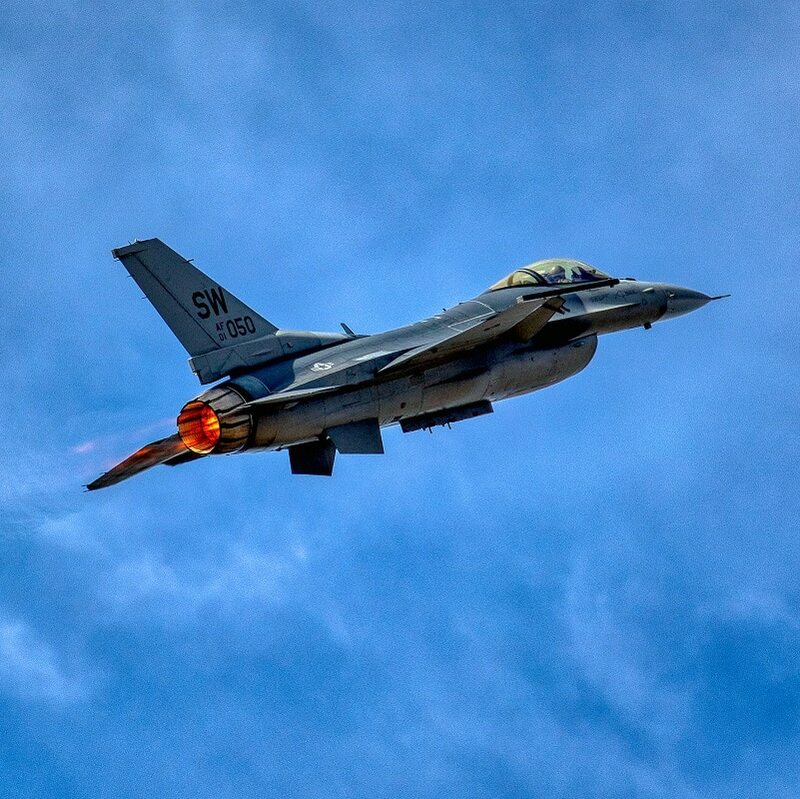 The Air Combat Command F-16 Viper Demonstration Team at Shaw AFB, S.C., performs precision aerial manoeuvres to demonstrate the unique capabilities of one of the Air Force’s premier multi-role fighters, the F-16 Fighting Falcon. The team also flies in Air Force Heritage Flight formations, exhibiting the professional qualities the Air Force develops in the people who fly, maintain and support these aircraft. The team’s F-16CM Fighting Falcon, affectionately known as the ‘Viper,” is a single-seat, multi-role fighter with the ability to switch from an air-to-ground to air-to-air role at the touch of a button. With its lightweight airframe and powerful General Electric engine generating 31,000 pounds of thrust, the F-16 can fly at speeds in excess of Mach 2. 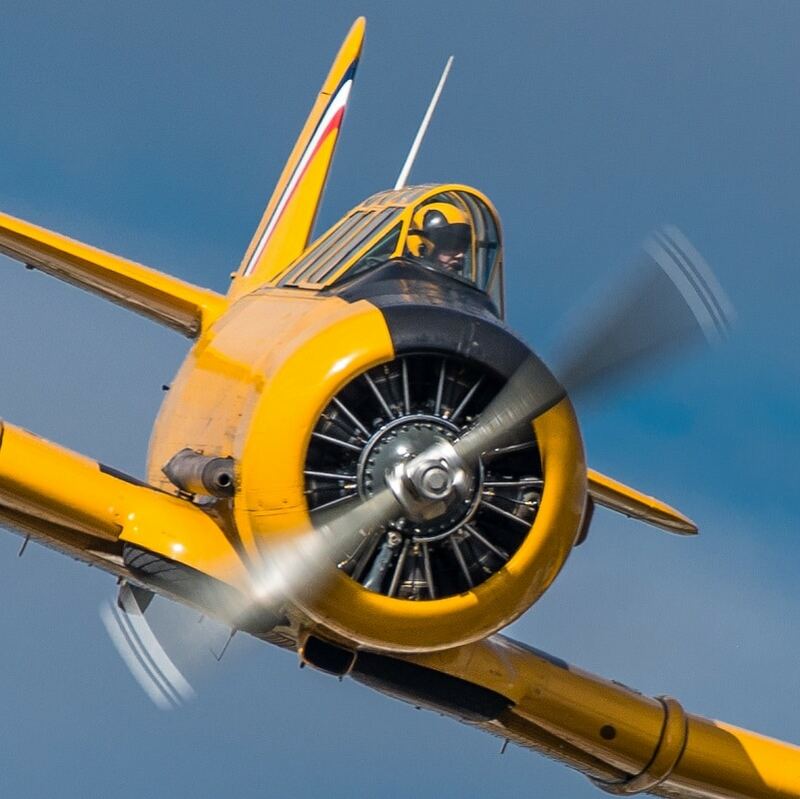 Yellow Thunder is a two ship aerial demonstration team flying ex-Canadian military aircraft, the Harvard. Pilots Dave Watson and Drew Watson skillfully demonstrate aerobatic manoeuvers based on RCAF pilot training. Airshow spectators will see manoeuvers that were taught to advance the pilot’s hand and foot coordination with the airplane. These manoeuvers were also the foundation for dogfighting, which would be used in the next airplane the student would move onto after the Harvard; usually the P-15 Mustang, the Spitfire, or the Hurricane.